The art of beadmaking by winding molten glass around a steel mandrel is often referred to as “Lampworking”. The early glass bead makers in Venice used oil lamps as their heat source for melting the glass. Today, we use a torch that uses a mix of propane as the fuel and oxygen as an accelerant, to get a precise flame that controls the heat in the glass as it melts. 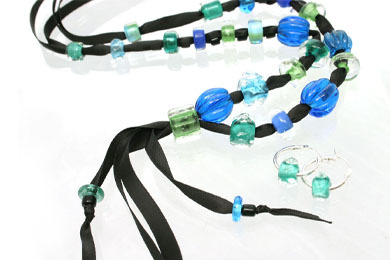 At our studio we offer members of the public the opportunity to try their hands at beadmaking. These classes are the perfect introduction with lots of fun! No previous experience is necessary, and each participant will enjoy the easy step-by-step learning process. These popular classes are for beginners with little or no experience with glass. It is an excellent opportunity for both individuals and ‘team building’ groups to try this creative process. 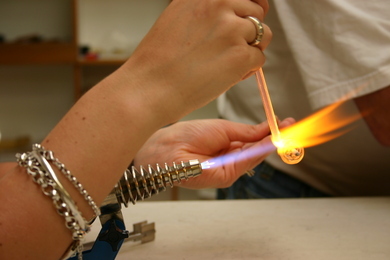 Demonstrations and ‘hands-on’ experience will introduce basic glassmaking techniques. Small class size allows for maximum interaction, creating a friendly and relaxed atmosphere. To shop online – look under JEWELLERY and you will find our latest collections of glass ear hoops, necklaces and pendants in stunning colours and designs.